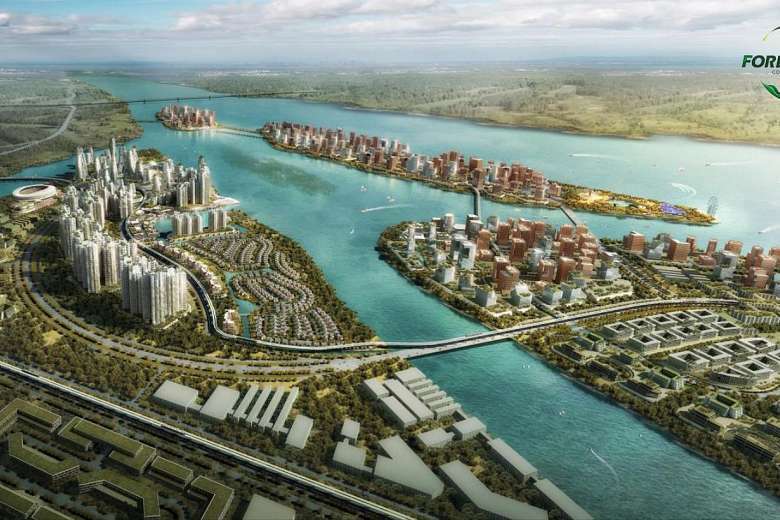 MALAYSIAN environmental authorities have approved reclamation works for the Forest City project in Johor, but for a reduced 1,386ha development instead of the initial 1,600ha. 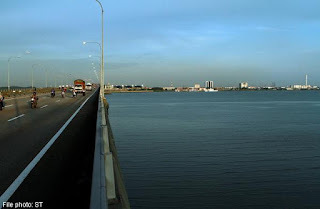 The project had faced resistance from Singapore & Malaysians living near the site, which is close to Tuas, over fears of damage to the ecology of the waterway between the 2 countries. Country Garden Pacificview (CGPV), the master developer, said in a statement yesterday that the Department of Environment (DoE) granted approval after accepting proposals in a Detailed Environmental Impact Assessment to "minimise or mitigate environmental impacts through integrated and workable solutions". Minister for the Environment & Water Resources Dr Vivian Balakrishnan emphasised Singapore’s concerns over Malaysia’s land reclamation projects in the Straits of Johor, during the 27th Annual Exchange of Visits between the environment ministries of Malaysia and Singapore. Dr Balakishnan led a delegation to Kuala Lumpur today (Nov 25) and met with Malaysia’s Deputy Minister of Natural Resources & Environment Dr James Dawos Mamit in Kuala Lumpur. At the meeting, Dr Balakrishnan reiterated Singapore’s request for such reclamation works to be suspended until Singapore has received and studied all the relevant information from Malaysia, including the Environmental Impact Assessments, and established that there would be no transboundary impact on Singapore from these projects. 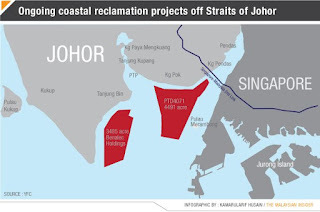 2 massive reclamation projects are under way in the Johor Strait despite the lack of environmental assessment reports & a move by Singapore asking about the impact of the development. According to a report by news website The Malaysian Insider yesterday, the reclamation has also raised concerns over how it will affect the livelihoods of fishermen, as well as ships using the nearby Port of Tanjung Pelepas. 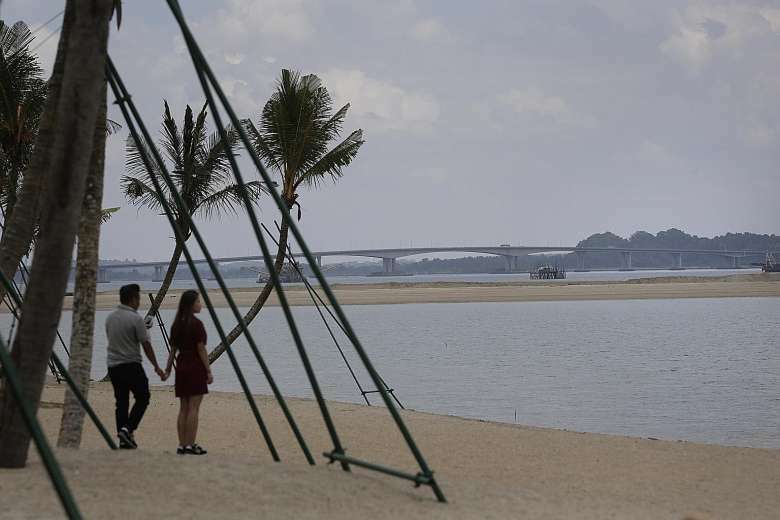 One of the projects is a 2,000ha man-made island - nearly 3 times the size of Ang Mo Kio estate - that will feature luxury homes and will be completed in 30 yrs' time. The RM600 billion mixed-development Forest City project in Johor will be scaled down by 30% following the green light by the Department of Environment (DOE) to the developer, The Star reported today. Initially planned to cover 1,978 ha, the project, which was suspended for about six months over environmental concerns, has been scaled down by about 610 ha. The new site reportedly covers about 1,368 ha. DOE approved the detailed environmental impact assessment (DEIA) on January 9. Phase 1 : 1,000 acres & Phase 2 : 1,000 acres. Reclamation works for Phase 1 began in December last year after the relevant approvals were secured, and there has been formation of land covering more than 100 acres at the project to date. Benalec Holdings Bhd has received the green light from the Department of Environment (DOE) for all three phases of its Tanjung Piai Integrated Petroleum and Petrochemical Hub and Maritime Industrial Park (TPMIP) project in Johor. The marine construction firm said on Thursday that the Detailed Environmental Impact Assessment (DEIA) study submitted by 70% owned subsidiary Spektrum Kukuh and Johor State Secretary Inc for Phases 2 and 3 got the nod on Friday last week. In a filing with Bursa Malaysia, the company said this was for the balance area of 2,407 acres of the total reclamation area of 3,487 acres. The go-ahead for Phase 1 of the project had been received in January 2015. THE MOST SOUTH-WESTERN TIP OF THE ASIAN CONTINENT - Approximately 3,485 acres of land will be reclaimed off the coast of Tanjung Piai and will form a man-made island to be sited off the south-western coast of Johor, Malaysia. Strategically located at the confluence of the Malacca Straits, Singapore Straits and Johor Straits, Tanjung Piai Maritime Industrial Park is well placed to capture value-added activities from one of the busiest shipping lanes in the world, including the movement of oil tankers equaling over a quarter of the global oil trade. Tanjung Piai Maritime Industrial Park lies at the mouth of the Pulai River just south of Port of Tanjung Pelepas, the second largest container port in Malaysia and the Tanjung Bin Area, site of a 2100 MW coal fired power station. 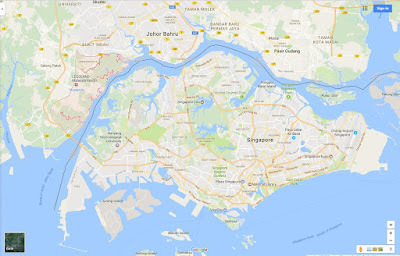 EXTREME PROXIMITY TO SINGAPORE - The site also lies about 10-15 km away from the Tuas-Jurong Industrial Estate and Jurong Island in Singapore. Additionally, the site is some 12km from the planned new megaport at Tuas being developed in Singapore to handle some 65 million TEUs upon completion of all of its 4 phases. The Tuas and Jurong industrial areas are home to many industrial plants and logistics facilities, including shipbuilding, offshore marine base, machinery manufacturing and the Jurong Port, an important port for handling bulk and general cargo. Jurong Island, being the largest fuel bunkering hub in the maritime industry, is one of the most important refining and petrochemical hubs in the world. NATURAL DEEP WATER AND VAST SEA FRONTING LAND - Besides its geographical strengths, Tanjung Piai Maritime Industrial Park boasts natural deep water between 24 to 30 meters which borders the site, enabling it to handle Very Large Crude Carriers (VLCC), Ultra Large Crude Carriers (ULCC) and even ValeMax Bulk Carriers with minimal capital and maintenance dredging. Direct access to the deep water of Malacca Straits can be achieved with the construction of a short jetty trestle just approximately 700 meters. The large anchorage areas surrounding the site also have capacity for up to 1,000 vessels. Upon completion of reclamation of this man-made island, the site will create vast land for future expansion and a total of 7-kilometer stretch of valuable seafront land which is able to accommodate up to 41 berths from the range of 2,000 DWT to 350,000 DWT. With Indonesia’s Sumatra Island acting as a natural breakwater to Tanjung Piai Maritime Industrial Park, it is a naturally sheltered harbour free from adverse weather conditions. Although our economy may not be in the best place right now, many people still look up to Singapore’s success, so much so that they’ve made it their long-term aspiration to replicate our city. In fact, copycat cities may be closer than we think. 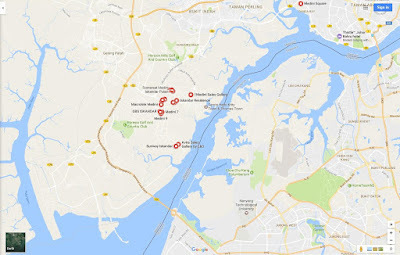 In Johor, Malaysia, Medini Iskandar Malaysia Sdn Bhd has been partnering with government-linked companies and other investors in order to create Malaysia’s largest single urban development, known as the Medini Project — touted as “Singapore-lite”. Not only does this have much potential, it’s also well-backed by massive Middle Eastern investors like Kuwait Finance House and Mubadala from Abu Dhabi, according to Forbes. Ten years ago, Imran Markar was using a GPS device to navigate his way around a patch of land at the southern tip of peninsula Malaysia, just across the narrow Straits of Johor from Singapore. The area had once been used to grow oil palms, but the plantations had gone to seed and it took a lively imagination to believe that much else would thrive. Today, the principal at Dubai-based United World Infrastructure (UWI) is able to drive around the same land on newly-laid roads that criss-cross a 2,300 acre, partially-completed building site, with dozens of cranes, apartments and office blocks rising up from the ground. The new city, named Medini, is part of the mega-development of Johor state being directed by the government’s Iskandar Regional Development Authority. Robert Pick, the former deputy head of the U.K.’s Marlborough College, recalls the day in 2009 when he stood atop a hill at the southern tip of Malaysia and scanned an endless sea of green palm oil trees. He strained to see the spot among the massive plantations where the private boarding school would build its first overseas branch three years later, Bloomberg Markets magazine will report in its September issue. Today, the 90-acre campus boasts more than 30 low-rise buildings divided by green lawns and tennis courts and is traversed by 376 students. Incorporated in 2008, Medini Iskandar Malaysia Sdn Bhd (MIMSB) initiates and support catalytic developments of the 2,230 acres of land identified as Medini Iskandar Malaysia (Medini). MIMSB takes on the responsibility to creatively innovate aspects of Medini with the latest, integrated, connected and smart city initiatives. As an integrated and comprehensive masterplanner for Medini, MIMSB has also made an impact as a developer, by building iconic developments that contribute to the growth of Medini. 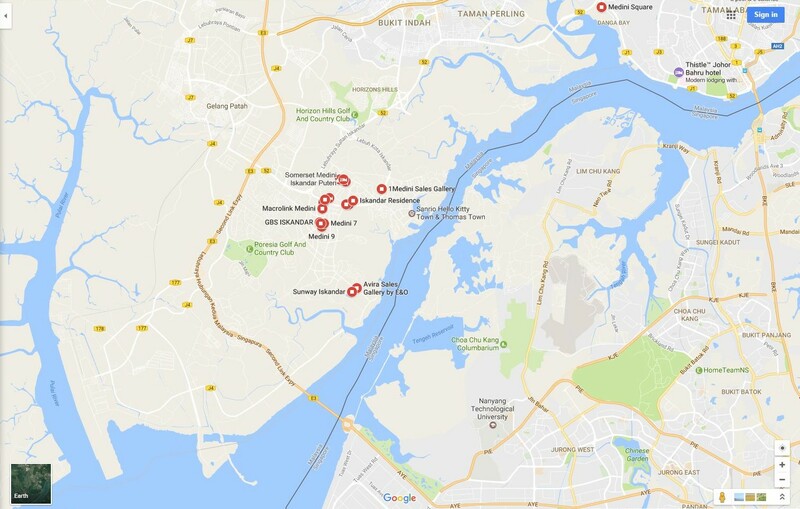 MIMSB has been working synonymously with other renowned developers such as UMLand, Sunway Iskandar, E&O, WCT, Mah Sing and many others, and this puts Medini on the map as the new destination in the region. Aspiring to be the Central Business District of Iskandar Puteri, Johor, MIMSB works very closely with investment and government organisations to make Medini the Icon of City Living for the Future. 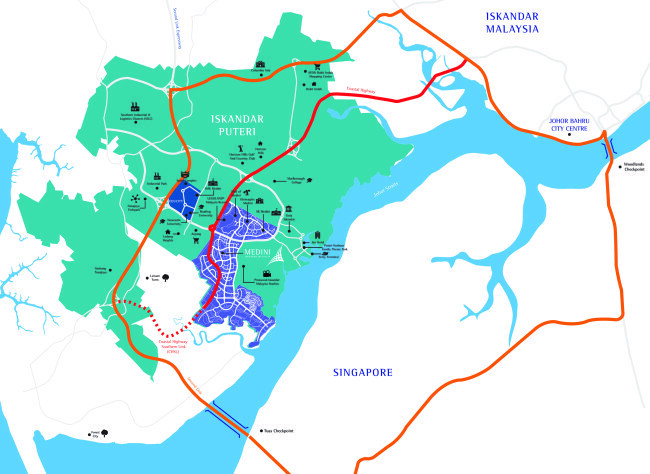 The story of Iskandar Malaysia (IM) has gone through several iterations since its inception in 2006. Conceived as a special economic zone within the southernmost state of Johor in Malaysia, IM stretches across an area of 547,832 acres (2,217 sq km) or three times the size of Singapore. 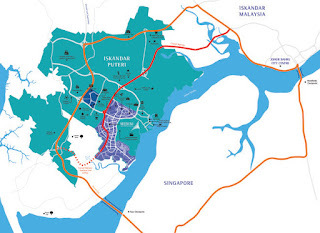 Within IM are five zones, with Iskandar Puteri (formerly Nusajaya) being the administrative center earmarked as one of the investment destinations for both local and foreign investors—with catalytic projects such as LEGOLAND® Malaysia Resort launched in 2012 and Gleneagles Medini Hospital that was opened last year. The sheer size of the economic zone has created more room for other catalytic developments. Rising to the challenge is United Malayan Land Berhad (UMLand), one of Medini Iskandar Malaysia (Medini)’s key developers, which will be rejuvenating an existing lake and promoting lakeside living. Medini Iskandar is the flagship development positioned as the new urban township of Iskandar Malaysia. Spanning an area of 9.3 sq km (2,230 acres), Medini Iskandar Malaysia (Medini Iskandar) is the flagship development positioned as the new urban township of Iskandar Malaysia. 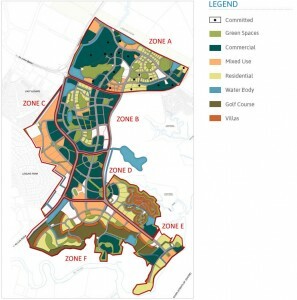 Medini Iskandar Malaysia (Medini) located within Iskandar Puteri is marked as Flagship Zone B under the Iskandar Malaysia development blueprint. 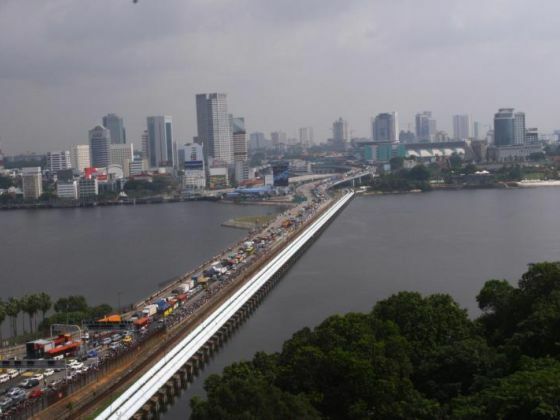 This economic development region is situated in the state of Johor, Malaysia. Medini is a 2,300 acres (9.3 km2) urban township development planned for a population of 450,000 by 2030. Medini is Malaysia’s largest single urban development to date and will become the smart and connected Central Business District of Iskandar Puteri. 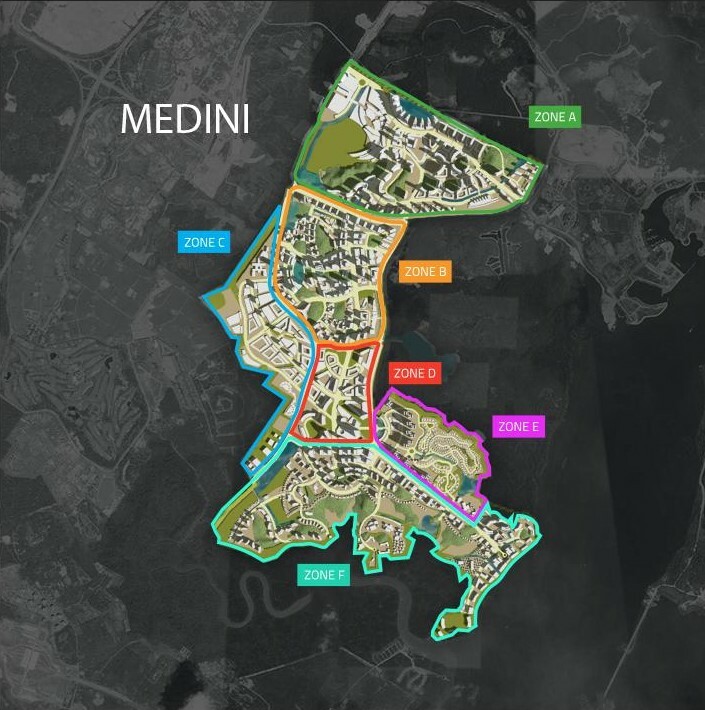 The gross development value of Medini stands at US$20 billion spanning 15 to 20 years. Signature developments in Medini include Mall of Medini and LEGOLAND®.Malaysia Resort (theme park), which is designed to provide activities for families and houses over 70 rides. Construction & reclamation for a luxury housing project to be built on a man-made island in the Johor Strait will continue, with Malaysia's Department of Environment (DoE) giving the developer the go-ahead. Work on the project off Tuas had been suspended from last June as concerns about its environmental impact were raised on both sides of the border. Since then, all parties have been waiting for a final verdict from the DoE. Singapore conveyed its concerns about the project on a number of occasions to the Malaysian government, asking for more information on the reclamation & construction works. 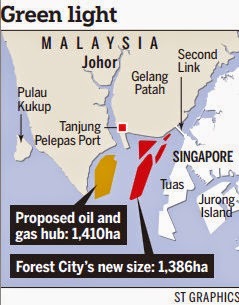 The mega Forest City project off Johor Baru seems to be going full steam ahead despite ongoing controversy over its reclamation plans & even as other developers have either shelved scheduled project launches or dropped them altogether. Forest City's China developer Country Garden has already started work on one of the 4 islands that will eventually comprise the largest mixed development in Johor Baru. The project has an estimated value of $58.3 billion and is slated to be completed in phases over the next 2 decades. Some reclamation of the Johor Strait has started, where the project will be connected to Johor via a 2-lane road. Work on at least one other island is under way as well. 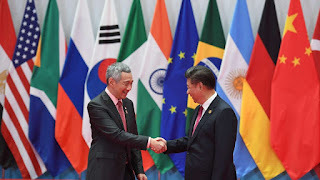 Maintaining good relations with both China and the United States is the right position to take, even if some might hope that Singapore would lean towards one country or the other, Prime Minister Lee Hsien Loong said yesterday. Mr Lee, who met Chinese President Xi Jinping and US President Donald Trump at the Group of 20 summit in Hamburg, Germany, last week, noted that Singapore is good friends with both countries. He was speaking at a dialogue at the FutureChina Global Forum last night, where he was asked questions covering topics from small-state diplomacy to global trade and business opportunities with China. A white paper released today by China on Asia-Pacific security cooperation has warned ‘small and medium size countries’ not to take sides in disputes between big countries, without naming the countries in question. The white paper, "China's Policies on Asia-Pacific Security Cooperation" was released by the State Council Information Office Wednesday on policies related to Asia-Pacific security cooperation, which also clarified the nation's stance on issues of regional concern. "Small- and medium-sized countries need not and should not take sides among big countries," according to the white paper, Sina reported Wednesday. All countries should work toward a new dialogue system instead of confrontation, and pursue partnerships rather than alliances, according to the white paper. Outlining China's concept of common, comprehensive, cooperative and sustainable security, the white paper explained the Chinese approach to achieving peace and stability in the Asia-Pacific region. Singapore has a broad, wide-ranging relationship with both China & the United States, said Prime Minister Lee Hsien Loong. He was giving his assessment of ties with both powers in an interview with Singapore reporters at the end of a 6-day visit to Germany, where he attended the Group of 20 (G-20) Leaders' Summit. Mr Lee also met Chinese President Xi Jinping & US President Donald Trump on the sidelines of the summit. The Republic will maintain a consistent position in its dealings with the major powers, even as it periodically re-calibrates policies to remain relevant, PM Lee Hsien Loong has said. In a broad-ranging dialogue session at the closing of the FutureChina Global Forum on Friday (Jul 14), Mr Lee cited examples of how the government-to-government projects between Singapore and China evolved over the years - from manufacturing to environmental needs to logistics and connectivity - as Beijing’s needs and priorities changed. Recently, it would seem that China isn’t too happy with Singapore. A Chinese diplomat has urged Singapore not to interfere in the territorial spat. A Chinese defence advisor has even gone so far as to call for sanctions to make Singapore pay for damaging China’s interests, on top of making remarks like Lee Kuan Yew has lost Beijing’s respect and how we’re playing a dangerous game of playing the big countries against each other. Some trashy tabloid in China, the Global Times, has been criticising Singapore too. 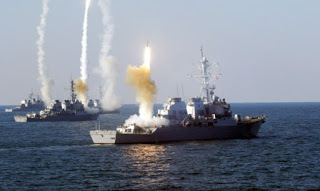 They wrongly claimed that Singapore had tried to push for a stronger statement on the international tribunal’s ruling on the South China Sea at the Non-Aligned Movement (NAM) summit last week in Venezuela. 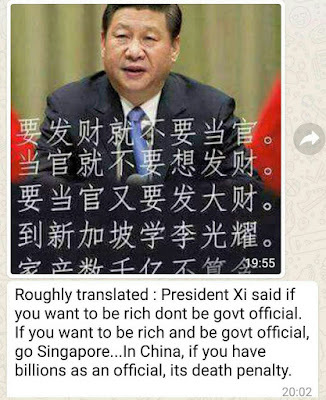 China users of various social media platforms have been lashing out against Singapore. They say that Singapore is backstabbing China. It would appear that many people in China are asking for their government to “punish” us. The latest is that Singapore businesses are being questioned by their Chinese counterparts about our stand on the matter. A senior Chinese diplomat urged Singapore to stay out of South China Sea disputes at a meeting between China and the Asean bloc of countries. The remark was made as China and the Association of Southeast Asian Nations made progress on Tuesday towards adopting a binding code of conduct in the South China Sea. Vice-Foreign Minister Liu Zhenmin said after the meeting in Manzhouli in Inner Mongolia that China and Asean had agreed to release a joint statement on a Code for Unplanned Encounters at Sea (CUES). 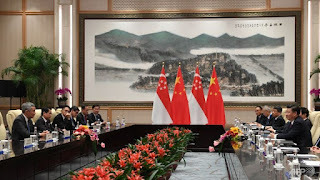 However, in a veiled criticism of Singapore’s stance on the disputes, Liu said China hoped the city state would perform well in its role of coordinating dialogue between China and Asean. “As Singapore is not a claimant in the South China Sea, we hope that the Singapore government, on the condition of not interfering in South China Sea issues, will actively promote cooperation between China and Asean,” Liu said. 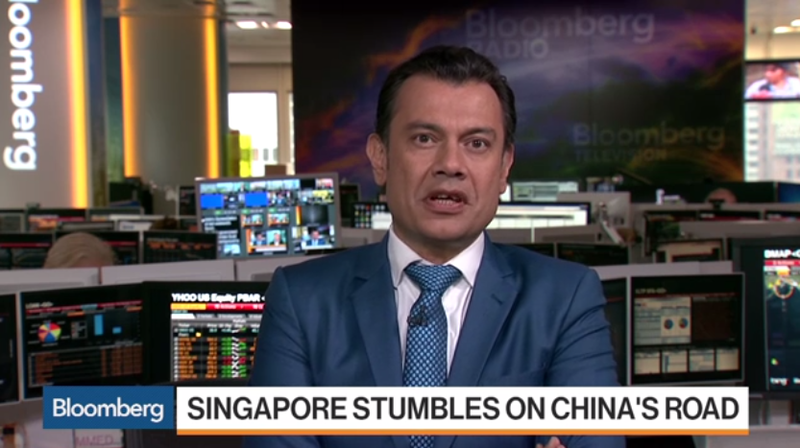 Can Singapore be friends with China and everyone else? The Republic of Singapore Navy (RSN) is celebrating its golden jubilee this year. As part of the celebrations, the RSN successfully organised the first International Maritime Review. Forty-six ships had gathered for the fleet review. That included the JS Izumo, a helicopter carrier from Japan. Singapore has the luxury of being principled in our foreign policy. While we are not rash in our interactions with other countries, we will not be bullied or intimidated. And thankfully so. Because if we can be bullied or intimidated, what will our immediate neighbours think? That said, we don’t go around picking fights. As long as other nations don’t threaten our long-term national interests, we are more than willing to be friends with them. That is the case with our immediate neighbours. That is the case with USA, Japan, India. And that is definitely the case with China. The event organised by China had heads of state & government from 29 countries attending, including 7 out of 10 from Asean. Singapore was represented by National Development Minister Lawrence Wong. 2 schools of thought prevailed: China snubbed Singapore. No, it was Singapore that didn't want to take part. Delegates from over 130 countries gathered in Beijing to discuss cooperation, trade and development at the first Belt and Road Forum for International Cooperation recently. Right after the conference ended, it came to light that Singapore's Prime Minister Lee Hsien Loong had not been present at the forum. Media speculated that Lee was not invited by China. For seasoned Asia-watchers, it was a watershed moment in regional affairs and marked the end of the era of amicable ties that Lee's father, Lee Kuan Yew, had so painstakingly nurtured with Asia's economic superpower. 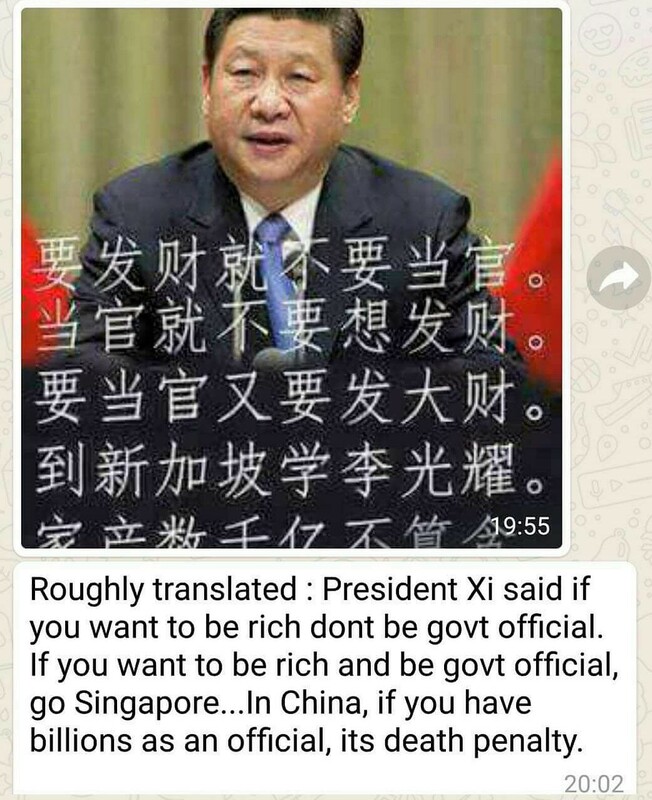 What this means is that China no longer regards Singapore as a friend. 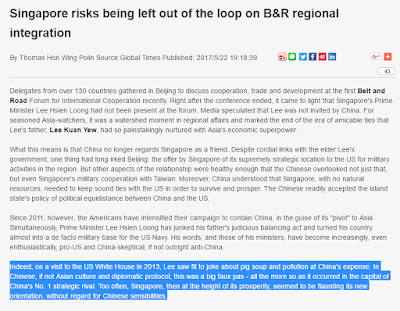 Despite cordial links with the elder Lee's government, one thing had long irked Beijing: the offer by Singapore of its supremely strategic location to the US for military activities in the region. But other aspects of the relationship were healthy enough that the Chinese overlooked not just that, but even Singapore's military cooperation with Taiwan. Moreover, China understood that Singapore, with no natural resources, needed to keep sound ties with the US in order to survive and prosper. The Chinese readily accepted the island state's policy of political equidistance between China and the US. Since 2011, however, the Americans have intensified their campaign to contain China, in the guise of its "pivot" to Asia. Simultaneously, Prime Minister Lee Hsien Loong has junked his father's judicious balancing act and turned his country almost into a de facto military base for the US Navy. His words, and those of his ministers, have become increasingly, even enthusiastically, pro-US and China-skeptical, if not outright anti-China. Indeed, on a visit to the US White House in 2013, Lee saw fit to joke about pig soup and pollution at China's expense. In Chinese, if not Asian culture and diplomatic protocol, this was a big faux pas - all the more so as it occurred in the capital of China's No. 1 strategic rival. China’s decision not to invite Singapore’s Prime Minister Lee Hsien Loong to last weekend’s Belt and Road Forum highlights the still-strained ties between the two countries, observers say, though officials in the Lion City have tried to shrug off talk of any diplomatic rift. 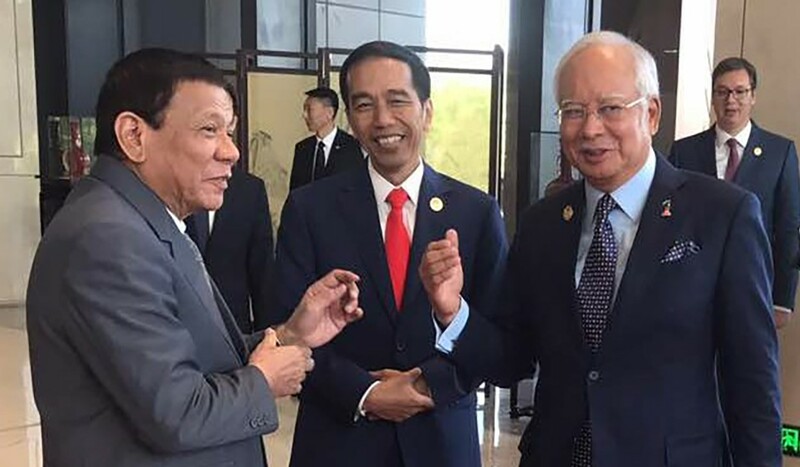 Of the 10 Association of Southeast Asian Nations (Asean) members, only three countries were not represented by their heads of government at the high-level summit in Beijing: Singapore, Thailand and Brunei. Twenty-nine national leaders and the representatives of 28 other countries attended the two-day meeting to discuss the China-led initiative to rebuild the ancient Silk Road trade route through a network of new ports, railways and roads. The Singapore delegation was led by national development minister Lawrence Wong. In an interview with travelling Singaporean media, Wong revealed that the invitations were decided by China. It was the first official acknowledgement that Lee was not invited. In the 14th century, Mongol dominance in Asia resulted in the Pax Mongolica, a framework of peaceful trading relationships straddling the Maritime and Overland Silk Roads, allowing the Kingdom of Singapura to flourish into a wealthy entrepot trading port. Today, the two roads are severed, and trade between Central Asia and Singapore is tiny, much more so for non-oil merchandise. The low volume of trade is evident considering Central Asia’s landlocked position presents a significant barrier of trade to the maritime trading hub that is Singapore. Today, China’s One Belt-One Road (OBOR) initiative promises to direct international attention to regional infrastructure development, effectively resurrecting a new Pax Sinica. This new economic paradigm could well create exciting new opportunities for Singaporean trade and investment in an untapped region. This report will focus on Uzbekistan, Kazakhstan and Turkmenistan, and the ways Singapore can capitalize on its unique expertise in the OBOR initiative. This was the view of “seasoned Asia-watchers”, said the pro-Beijing newspaper, The Global Times. PM Lee not invited to Belt and Road forum, is S’pore in trouble? The high-profile “Belt and Road” Forum recently held in Beijing from May 14 to 15, attended by 29 national leaders and the representatives of 28 other countries, captured the world’s attention with Chinese President Xi Jinping pledging to splash the cash to help revive ancient trade routes and build infrastructure across the region. The amount of investment planned so far for the initiative is massive – over US$1 trillion. Even more trade and investment plans – US$113 billion-worth – was announced at the forum on top of previous commitments. It is no wonder that, China’s growing political and economic dominance coupled with the scope of “Belt and Road” has sparked concerns of possible debt-trap diplomacy among countries that have benefited or will benefit from China’s ambitious regional agenda. But while nearly half of the 57 countries were not represented by their heads of government, foreign policy experts said Lee’s absence was conspicuous as it provided clues on the extent of the fallout following a protracted diplomatic spat between the two countries over the past year. Xue Li, a senior research fellow at the Chinese Academy of Social Sciences think tank, said China’s decision not to invite the Singaporean leader reflected a growing belief in Beijing that the Lion City sought only economic benefits from China, while “relying on the US for security”. 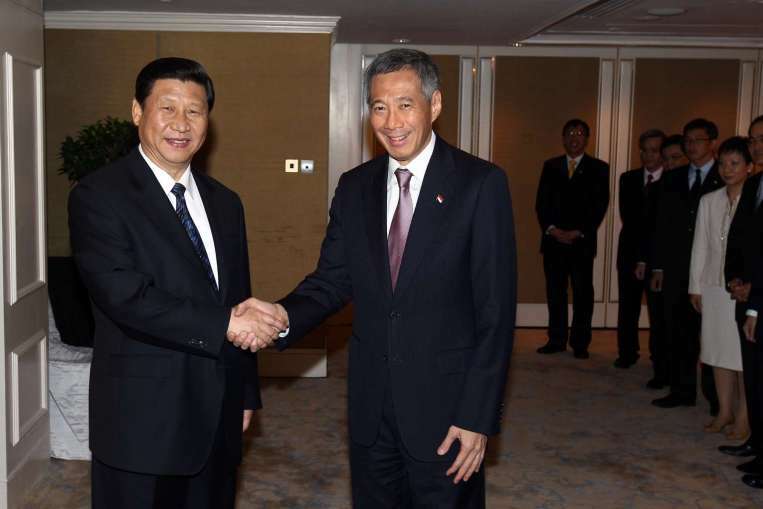 “China is gradually recognising this and therefore doesn’t really care if the Singapore PM attended or not,” Xue said. China’s plan for a maritime “Silk Road” to Europe is helping channel funds to Southeast Asia for roads, railways and ports. But amid the deals bonanza, one country risks missing out. Despite strong historical and cultural ties to China, the tiny state of Singapore has found itself in Beijing’s crosshairs, in part for its stance over territorial disputes in the South China Sea. As other Southeast Asian leaders lined up to meet President Xi Jinping at a summit in Beijing this week for his Belt-and-Road Initiative, Singapore was represented by National Development Minister Lawrence Wong. 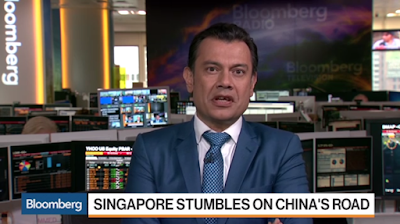 China views Singapore as being less supportive of Xi’s plan. Among the 29 Heads of State who converged on Beijing for the Belt and Road Summit earlier this week were leaders of seven of the ten ASEAN states. 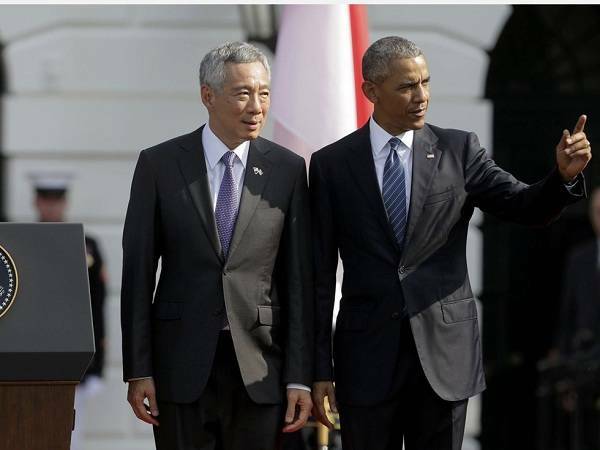 One leader was noticeably missing: Singapore’s Prime Minister Lee Hsien Loong. Various observers have noted this absence, including Hugh White, who suggested it was no co-incidence that, like others - Japan, India, Australia and ‘most western countries’ - who had not sent their national leaders to Beijing, Singapore was aligned with the US and uneasy about China’s rise – ‘or perceived to be so’. However, it has since emerged that Singapore was never given the choice. China had not invited Singapore’s prime minister in the first place. This is surprising, especially as Singapore has been one of the biggest advocates of the Belt and Road Initiative (BRI). While many other states were initially hesitant in signing up to BRI, including some of its ASEAN neighbours, Singapore’s support has been unequivocal from the beginning. Many high-level co-operation talks between China and Singapore on the subject have taken place, with both sides warmly welcoming cooperation on BRI. PM Lee’s absence in B&R forum in Beijing – is China still throwing a tantrum? The reply by Minister of National Development, Lawrence Wong, was a curious and perhaps a telling one. When asked by reporters on Tuesday why Prime Minister Lee Hsien Loong was not attending the Belt and Road forum in Beijing, Mr Wong said “the invitation was decided by the Chinese”, according to the Straits Times. Mr Wong did not seem to have elaborated on his answer. 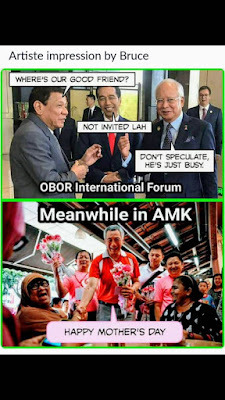 PM Lee’s absence has not gone unnoticed, given how several leaders from Asean countries were among the 29 heads of states who apparently were invited and attended the forum which ran from 14-15 May. Considering that the forum was also an important one, for China especially, the fact that PM Lee was not there is quite curious. After all, Singapore and China share, at least according to official statements, “deep ties’. As a Singaporean, I am worried. China is doing what is in her interests. So, even if Singapore ends up being destroyed, we have ourselves to blame for not responding to this threat. Don’t blame China. It would be nice if answers can suggest how Singapore can adapt to this threat. related: Will Singapore falter after One belt one road initiative? In 2015, Singapore exported US$61.3 million worth of goods and services to Central Asia, while importing US$6.1 million, representing 0.015 percent of Singapore’s total exports and 0.002 percent of total imports; and 0.07 percent of Central Asia’s total exports and 0.009 percent of total imports. While Singapore is a global trading and investment powerhouse, business experience and exposure in Central Asia has never been strong. In 2014, only 32 enterprises in Uzbekistan operated with Singaporean capital, and Singapore contributed only US$50 million of direct investment to Kazakhstan over the last ten years in contrast to US$604 billion of total foreign direct investment in 2014 alone. Central Asia is not directly connected to Singapore, and land routes to ports in the region are scant. However, as the One Road-One Belt Initiative links Central Asia to China’s eastern seaboard, Gwadar port and even the impending sanction-free Iran; inter-regional trade is awash with new connections and opportunities. Why wasn't Singapore's PM Lee Hsien Loong invited to China's Belt and Road Summit? When asked why Singapore Prime Minister Lee Hsien Loong did not attend the Belt & Road Forum, which was attended by 29 heads of state & government, including many from South-east Asia, Mr Wong said the invitation was decided by the Chinese. He noted that the focus of the forum was on outbound investments, & in getting Chinese investments abroad and encouraging Chinese companies to go overseas. "We don't have any specific projects as of now that may be part of this Belt & Road (initiative) in terms of infrastructure," he said. IT DIDN’T escape notice that Prime Minister Lee Hsien Loong wasn’t at the biggest diplomatic event held in China over the weekend. The guest list was filled with luminaries including his counterparts in the Philippines, Malaysia and Indonesia. There were in all 29 heads of state or government. Singapore was represented instead by Minister Lawrence Wong. Asked why the PM Lee wasn’t there, he said that the invitation was decided by the Chinese. So on Sunday, PM Lee was giving out flowers to his Ang Mo Kio constituents on the occasion of Mother’s Day, rather than hobnobbing with other leaders over what seemed to be the most ambitious economic project in recent time. His absence in Beijing is intriguing and only serves to raise questions about whether Singapore and China had papered over their differences since the seizure of Singapore Armed Forces vehicles by Hong Kong authorities in November last year. Or are the Chinese still pissed off at Singapore’s lack of empathy over its position on the South China Sea? "At the same time, China is still far too dependent on imports through the Malacca Strait to seriously oppose Singapore. The seizing of goods in ports can, after all, easily be done by both parties." 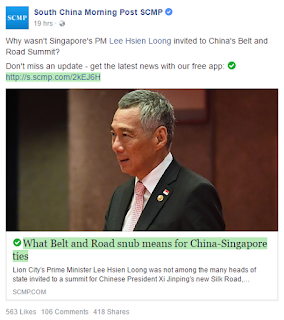 According to China state media South China Morning Post (SCMP), the China central government has confirmed that Lee Hsien Loong was deliberately left out of the invitation at the Belt and Road forum. Of the 10 ASEAN countries, Singapore Prime Minister’s absence is painfully conspicuous because Singapore is supposed to take over the ASEAN Chairmanship next year (2018). 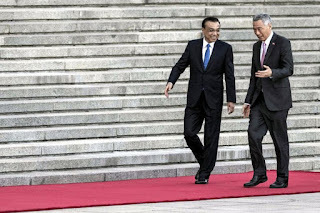 When interviewed by a foreign media why he was not invited to the China meeting, Lee Hsien Loong gave an awkward silence. China and Singapore on Monday agreed to further synergize development strategies and deepen mutually beneficial cooperation to advance their ties. The pledge came out of a meeting between Chinese Vice Premier Zhang Gaoli and Singapore Deputy Prime Minister Teo Chee Hean in Beijing. 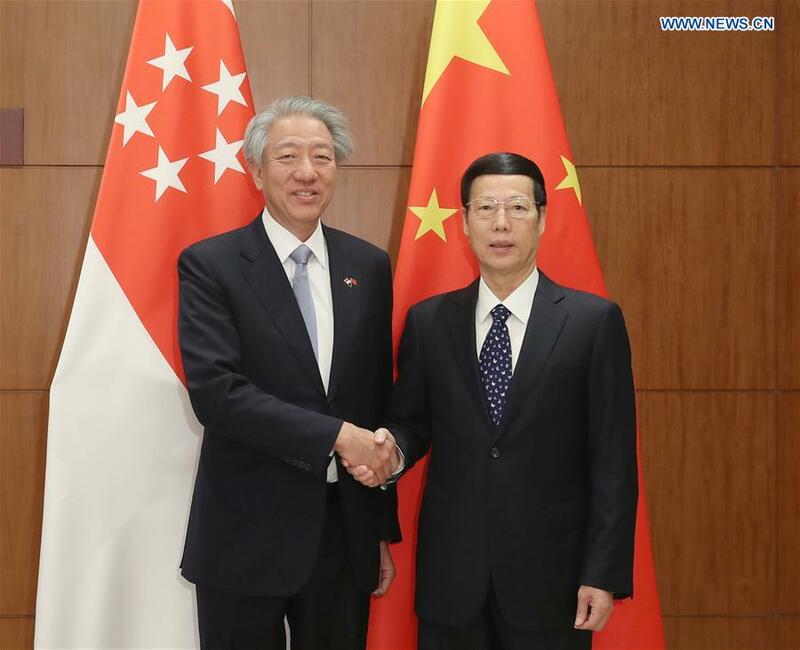 China attaches great importance to developing relations with Singapore and is willing to make joint efforts with the country to sincerely implement the consensus reached by leaders of both sides, said Zhang. The Joint Council for Bilateral Cooperation, the highest level of bilateral cooperation between China and Singapore starts today, February 27. 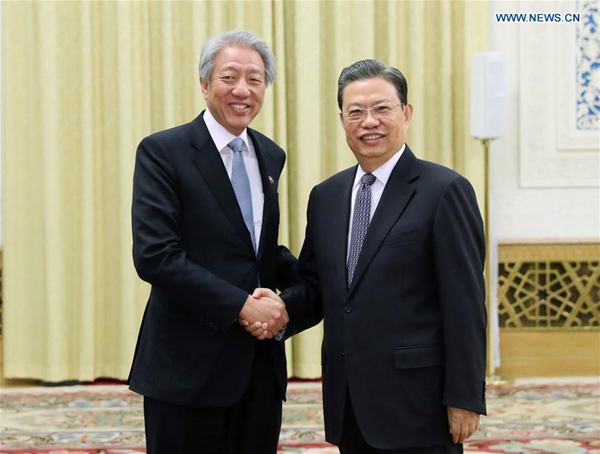 Singapore Deputy PM Teo Chee Hean arrived in Beijing on Sunday for a three day visit at the invitation of China's Vice Premier Zhang Gaoli. Both leaders are co-chairs of the platform, which is for promoting dialogue between China and Singapore. This is a good development, and at this stage it is important to remember, that ASEAN neutrality is key for a Chinese grand strategy and Chinese policy makers should keep that in mind, and work to bolster that. There have of course been challenges regarding geopolitics, despite which, trade and economic relations between the two Asian countries continue to flourish and China is the biggest foreign investor in Singapore. Singapore is also among the top trading partners of China. Mr Teo sounded extremely cautious and diplomatic when he said that there are bound to be differences; given each country in the region has a different history and different sensibilities -- a nod at the current geostrategic questions in the Asia pacific. China and Singapore on Monday pledged to strengthen cooperation in the "Belt and Road" Initiative. 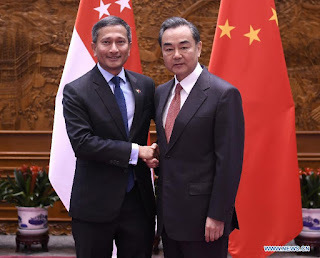 Chinese Foreign Minister Wang Yi met with his Singaporean counterpart Vivian Balakrishnan on the sidelines of a series of high-level cooperative meetings between the two countries. Stressing the significance of building "a partnership of all-round cooperation keeping with the times", Wang called on both sides to beef up "Belt and Road" cooperation, facilitate regional integration, and promote the building of a closer community of common destiny between China and the Association of Southeast Asian Nations (ASEAN). By signing new agreements, have China and Singapore kissed and made up? In a clear sign that China and Singapore are back on an even keel after a series of diplomatic spats, senior officials from both sides signed a number of major agreements on Monday. The agreements on a range of issues, including intellectual property rights and a US$1.4 billion project aimed at boosting transport links between Chongqing and Southeast Asia, were signed after a meeting chaired by China’s Vice-Premier Zhang Gaoli and Singapore’s Deputy Prime Minister Teo Chee Hean. Relations between the two countries have been strained since Singapore voiced support for an international tribunal ruling that dismissed most of China’s claims to the South China Sea. Tensions were further ratcheted up in November after the seizure of nine armoured vehicles from Singapore in Hong Kong. The troop carriers had taken part in military exercises in Taiwan. Singaporean Prime Minister Lee Hsien Loong said over the weekend that the country's relations with China are "broad and substantial," even though many believe that the bilateral ties are strained due to incidents such as Hong Kong's seizure of nine Singaporean Armed Forces armored vehicles in November. The two countries agreed recently to hold a Joint Council for Bilateral Cooperation (JCBC), a mechanism started in 2004 but suspended in 2016, next month. 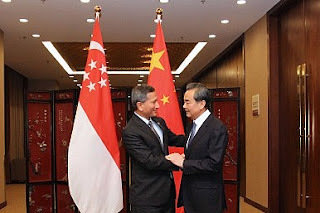 But the future development of China-Singapore relations requires more than a JCBC meeting. Both sides, Singapore in particular, need to do some self-reflection and renew their relationship. In the South China Sea disputes, Singapore, which is a coordinator for China-ASEAN ties and not a claimant, instigated ASEAN to confront China while China tried to cool the tensions. Singapore seemingly assumed the role of the Philippines under the administration of former president Benigno Aquino III, continuing to stir up the South China Sea waters. Lee's snubbing China on his trips to the US and Japan in August and September as well as his endorsement of the South China Sea arbitration ruling failed to employ sophisticated balancing tactics and offset his skillful facilitation of the historic cross-Straits meeting between Xi Jinping and Ma Ying-jeou in November 2015. Singapore and China have signed four cooperation pacts, including one for each of the three government-led projects, a day after inking 15 agreements on mainly commercial deals. Deputy Prime Minister Teo Chee Hean and Chinese Vice-Premier Zhang Gaoli witnessed the signing ceremony yesterday after they reviewed the progress made in the three bilateral flagship projects and discussed the direction of future bilateral cooperation. Xinhuanet: During your visit to China, you'll co-chair the 13th Singapore-China Joint Council for Bilateral Cooperation. What's your expectation of the visit? DPM: I am pleased to be in Beijing to co-chair the 13th Joint Council for Bilateral Cooperation (JCBC) with Vice-Premier Zhang Gaoli. The JCBC is the premier platform for Singapore-China bilateral relations. Since its establishment in 2004, the JCBC has played a key role in nurturing the special friendship & promoting closer cooperation between our 2 countries. At every JCBC, we review the wide-ranging areas of cooperation, including business and trade, financial services, inclusive & sustainable development, human resource development & people-to-people exchanges, & agree on initiatives to strengthen & deepen our broad-based bilateral relations. This year, apart from reviewing the progress of our 1st 2 bilateral government-to-government projects at the 18th Suzhou Industrial Park (SIP) & the 9th Sino-Singapore Tianjin Eco-City (SSTEC) Joint Steering Councils, Vice-Premier Zhang & I will also co-chair the inaugural Joint Steering Council (JSC) Meeting for the Chongqing Connectivity Initiative (CCI), our third bilateral government-to-government flagship project. Both countries have placed emphasis on the CCI as it is a key priority demonstration project under China's "Belt and Road", Western Region Development & Yangtze River Economic Belt Strategies. This was discussed when Prime Minister Lee Hsien Loong met President Xi Jinping in Beijing in 2014, & launched by the 2 leaders during President Xi's state visit to Singapore in November 2015. Prime Minister Lee personally visited Chongqing in September 2016 to review the progress of our bilateral cooperation in the CCI. China said yesterday it will hold a series of meetings in Beijing with S'pore on Monday, adding that it highly valued ties with Singapore and was ready to further strengthen mutual trust & cooperation. Details of the meetings were announced yesterday at a daily press briefing by Foreign Ministry spokesman Geng Shuang. S'pore Deputy Prime Minister Teo Chee Hean, who was invited by his Chinese counterpart Zhang Gaoli, will visit China from Sunday to March 1, said Mr Geng. China and Singapore will hold a series of meetings in Beijing on Feb. 27, discussing cooperation projects and mapping out the future of bilateral relations. Singapore Deputy Prime Minister Teo Chee Hean, invited by his Chinese counterpart Zhang Gaoli, will visit China from Feb. 26 to March 1 and, with Zhang, will co-chair the 13th meeting of China-Singapore Joint Council for Bilateral Cooperation, a high-level institutional mechanism established in 2003 to oversee the entire range of bilateral cooperation. 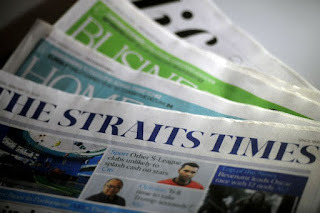 Foreign Ministry spokesperson Geng Shuang told a daily press briefing on Wednesday that the two officials will also preside over the 18th China-Singapore Joint Steering Council Meeting for the Suzhou Industrial Park, the ninth China-Singapore Joint Steering Council Meeting for the Tianjin Eco-city, and the first China-Singapore Joint Steering Council Meeting for the Demonstration Initiative on Strategic Connectivity in Chongqing. The top bilateral forum between Singapore and China will be held next month, the Republic’s Ministry of Foreign Affairs said on Tuesday (Jan 17) after senior diplomats from both countries held a meeting here. The Joint Council for Bilateral Cooperation (JCBC) is the top bilateral body overseeing cooperation between Singapore and China. 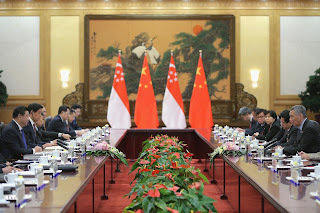 It is co-chaired by Deputy Prime Minister Teo Chee Hean and Chinese Vice Premier Zhang Gaoli. The Singapore MFA gave no further details about the upcoming meeting. China's Vice Foreign Minister Liu Zhenmin met Singapore's Permanent Secretary for Foreign Affairs Chee Wee Kiong in Singapore on Tuesday (Jan 17) and discussed upcoming bilateral exchanges such as the Joint Council for Bilateral Cooperation to be held next month, and the China-Singapore Forum on Leadership later this year. According to a post on the website of Singapore's Ministry of Foreign Affairs (MFA), the two co-chaired the 10th Bilateral Consultations between the Singapore and Chinese foreign ministries. During their meeting, Mr Chee and Mr Liu "reviewed the longstanding and multi-faceted cooperation between Singapore and China". SINGAPORE and China have strong levels of cooperation but the two countries are different and it is normal that they don't see eye-to-eye on every issue all the time, Prime Minister Lee Hsien Loong has said. "We are different countries, so it's quite natural that we have different perspectives on issues," he told the Singapore media on the sidelines of the Group of 20 (G-20) leaders' summit in the eastern Chinese city of Hangzhou. Singapore took over from Thailand as the dialogue coordinator of Asean-China relations in August 2015 for a three-year term. Launched in November 2003 by then Prime Minister Goh Chok Tong and former Chinese Premier Wen Jiabao, the JCBC is the highest-level institutional mechanism for bilateral cooperation. It is co-chaired by both countries at the Deputy Prime Minister (DPM)/ Vice Premier level. Currently, the JCBC is co-chaired by DPM Teo Chee Hean and Chinese Vice Premier Zhang Gaoli. Zhang is the highest-ranking Vice Premier in China’s State Council and a member of the Politburo Standing Committee (PSC) of the Chinese Communist Party, the top leadership body in China. This level of bilateral dialogue is unique as it is unlike other bilateral mechanisms China has with other countries. For example, the U.S.-China Strategic and Economic Dialogue is co-chaired by Secretary of State John Kerry and Treasury Secretary Jacob J. Lew and Chinese State Councillor Yang Jiechi and Vice Premier Wang Yang, who are not members of the PSC. Foreign policy experts say bilateral ties look likely to thaw sooner rather than later after Chinese Vice-Foreign Minister Liu Zhenmin’s ( 劉振民 ) visit to the island republic this week for a scheduled meeting with its foreign policy bureaucrats. 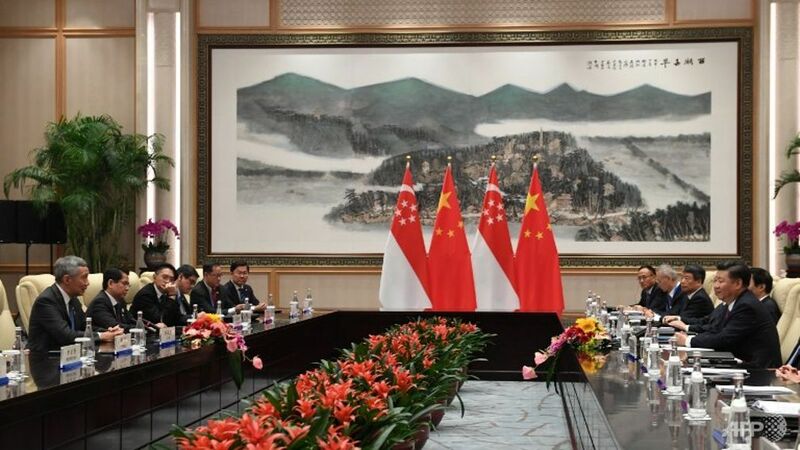 In a statement about the ministry-level meeting, Singapore said the Joint Council for Bilateral Cooperation (JCBC) – an annual bilateral forum featuring both countries’ deputy premiers – would take place next month. Photographs of Tuesday’s meeting between Liu and Chee Wee Kiong, permanent secretary of Singapore’s foreign ministry, showed the two men and other officials tossing the “yu sheng” prosperity salad to mark the Lunar New Year. An opinion piece was published on the Global Times, cautioning PM Lee Hsien Loong with regard to what he said during his recent official state visit to US. The Global Times is a daily Chinese newspaper published by the People’s Daily news group, which is the biggest newspaper group in China. This news group comes directly under the purview of the Chinese Communist Party. News published by the group frequently provides direct information on the policies and viewpoints of the Chinese government. The Global Times was created to focus on international issues from the Chinese government’s perspective. As such, opinion pieces featured in Global Times carry considerable weight in representing the position of the Chinese government. The piece published on 4 Aug, started by saying that President Obama had given PM Lee a grand reception, usually reserved for leaders of big countries and American allies. Up till about a year ago, relations between S'pore & China could loosely be grouped into two eras: Mao and post-Mao. S'pore and China mark 25 years of diplomatic relations this year. On Friday (Nov 6), President Xi Jinping and his wife Peng Liyuan will make their first state visit to Singapore. In many ways, the ties between Singapore, a city-state of 5.5 million, and China, a behemoth with 1.4 billion people, have been unique. 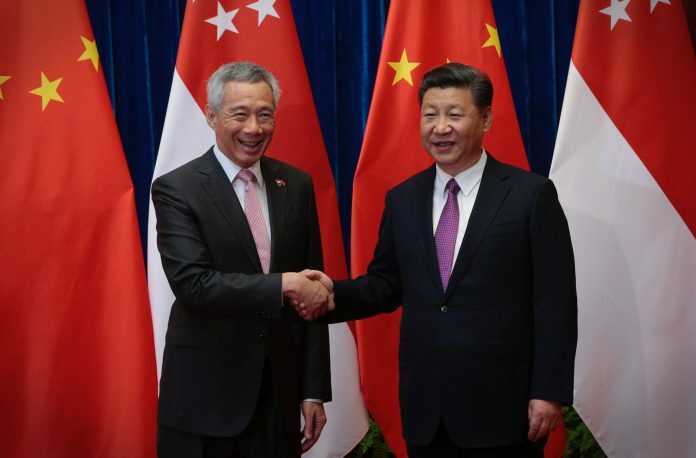 Last year, S'pore and China commemorated 25 years of diplomatic relations, culminating in the exchange of state visits by Singapore President Tony Tan and Chinese President Xi Jinping. We established an All-Round Cooperative Partnership Progressing with the Times. Singapore and China have had interactions for many centuries. S'pore has always been part of the Maritime Silk Road. The majority of our (Singapore’s) citizens have ancestors from China. We enjoy a long-standing, wide-ranging relationship that transcends politics. The landmark visits by Singapore’s first prime minister Lee Kuan Yew (1976) and China’s former paramount leader Deng Xiaoping (1978) laid a strong foundation for the modern phase of our bilateral relations, prior to the establishment of formal diplomatic ties in 1990. Lee Kuan Yew always believed that a strong China that was positively engaged with Southeast Asia would strongly benefit the region. That was why he suggested we jointly develop the Suzhou Industrial Park in 1994, our first government-to-government project, to promote the exchange of development experiences. China and Singapore are good neighbors, and the friendship between our countries and peoples is rooted in history. This year marks the 25th anniversary of the diplomatic ties between China and Singapore. Over the past 25 years, thanks to the joint efforts from both sides, our bilateral relations have enjoyed fast and ever-deepening growth in an all-round way, and mutually beneficial cooperation has achieved fruitful outcomes in areas like economy and trade, investment, finance, social governance and cultural and people-to-people exchanges. Looking into the future, China-Singapore friendship boasts great potential and broad prospect, and is about to enter a new era of rapid growth. The Chinese embassy in Singapore is committed to promoting continued growth of our friendship and all-round cooperation. We sincerely hope this website will be your friend and serve as a window on China and China-Singapore relations and also a bridge of friendship between our peoples. 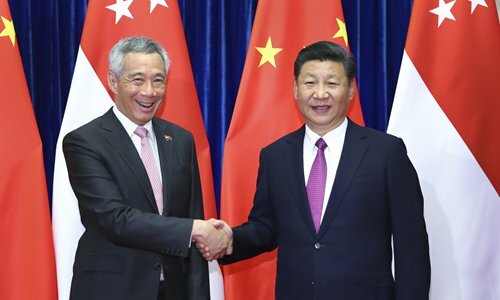 Beijing says it hopes Singapore can play a constructive role for peace and stability in the region, as it welcomes the country's prime minister who has been caught in a media storm recently for his China-related remarks. 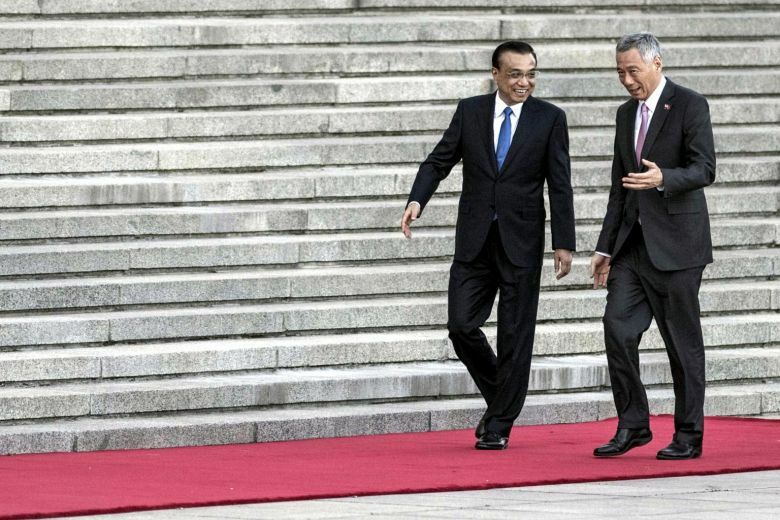 Welcoming his Singaporean counterpart, Premier Li Keqiang told Prime Minister Lee Hsien Loong that China is determined to seek peaceful development. But the country's will to safeguard national sovereignty and territorial integrity is unswerving, said Li, referring to territorial disputes with some neighboring countries. 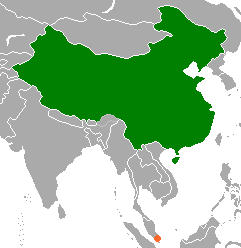 China and Singapore established diplomatic relations on 3 October 1990. After the founding of New China, Singapore, then under the rule of British colonial authorities, maintained people-to-people trade relations with China. The contacts between the two countries began to increase since mid-70s.The two sides established their Commercial Representatives' Offices in each other's country in 1981 and started their air service in 1985. Since the establishment of diplomatic relations of the two countries, President Yang Shangkun (in 1993), President Jiang Zemin (in 1994), Chairman of Chinese People's Political Consultative Conference Li Ruihuan (in 1995) and Premier Li Peng (in 1997) from China visited Singapore. Prime Minister Lee Kuan Yew (in 1990), President Wee Kim Wee (in 1991), Senior Minister Lee Kuan Yew (in 1992, 1993, 1994, 1995, 1996, 1997, 1999, and 2000), Prime Minister Goh Chok Tong (in 1993, 1994, 1995, 1997 and 2000), President Ong Teng Cheong (in 1995), Deputy Prime Minister Lee Hsien Loong (in 1995 and 2000) and Deputy Prime Minister and Minister for Defense Tony Tan Keng Yam (in 1997) from Singpore visited China. Singapore has Consulates-General in Shanghai, Xiamen and Hong Kong. Singapore-China ties will remain strong even after the death of founding prime minister Lee Kuan Yew, said President Tony Tan Keng Yam, after he became only the second Singapore leader after Mr Lee to be conferred an honorary doctorate in China. "Mr Lee's passing marks the end of an era but it does not mean the end of strong China-Singapore relations," Dr Tan said yesterday in response to a question from a student at Nankai University. The institution conferred the doctorate on Dr Tan for his contribution to bilateral ties. "We have established other platforms. Our ministers meet very frequently, many delegations of officials from China visit Singapore, and from Singapore to China, to learn from each other." Singapore enjoys strong and substantive relations with China, anchored by a steady flow of high-level visits, strengthening economic ties, and growing people-to-people exchanges. Over the past year, Prime Minister Lee Hsien Loong, Deputy Prime Ministers Teo Chee Hean and Tharman Shanmugaratnam, Emeritus Senior Minister Goh Chok Tong, Minister for Foreign Affairs K Shanmugam and other Ministers made separate visits to China. From the Chinese side, Politburo Standing Committee Member and Vice Premier Zhang Gaoli, Poliburo Members Zhao Leji and Sun Chunlan, Minister of Foreign Affairs Wang Yi and Anhui Party Secretary Zhang Baoshun visited Singapore. In October 2013, Deputy Prime Minister Teo and Vice Premier Zhang co-chaired the 10th Joint Council for Bilateral Cooperation as well as Joint Steering Councils for both the Suzhou Industrial Park and Tianjin Eco-city. The growing people-to-people exchanges between the two countries are supplemented by on-going programmes in Human Resource Development (HRD) cooperation. Both sides also enjoy close cooperation in regional and international fora. Singapore and China continue to enjoy robust economic ties. In 2013, China became Singapore's largest trading partner, with bilateral trade in 2013 rising 11.0% from the previous year to S$115.2 billion. As of 2012, China remained our top investment destination. Besides our two flagship government-to-government projects – the Suzhou Industrial Park and the Tianjin Eco-city – we have also stepped up economic engagement with China at the provincial level through our seven provincial councils in Sichuan, Shandong, Liaoning, Zhejiang, Tianjin, Guangdong, and Jiangsu. Both sides have also strengthened economic links through private sector-led initiatives such as the Guangzhou Knowledge City, the Singapore-Sichuan Hi-Tech Innovation Park, and the Jilin Food Zone. The China-Singapore Free Trade Agreement (CSFTA), which came into effect in January 2009, is the first comprehensive bilateral FTA that China has concluded with an Asian country. Singapore and China have also agreed to enhance financial services cooperation under the CSFTA. Going beyond the traditional parameters of economic cooperation, Singapore and China are also exploring new spheres of collaboration in education, culture, social management and finance. Some recent initiatives include the Singapore-China Forum on Social Management, the education and research collaboration between the Singapore University of Technology and Design, the Massachusetts Institute of Technology, and Zhejiang University, and the establishment of the China Cultural Centre in Singapore. Singapore also welcomed the arrival of the two Giant Pandas, Kai Kai and Jia Jia, in September 2012. People's Republic of China – Singapore relations officially started on October 3, 1990. Diplomatic missions were established in the early 1990s based on trade and the warming of ties from other ASEAN countries towards mainland China. Historic links between the two nations' people began much earlier than the founding of the People's Republic of China in October 1949. Migrant Chinese labourers escaping poverty and war came to what was known as Nanyang to the Chinese to Singapore, which was part of the Straits Settlements. Many ethnic Chinese Singaporeans derived their ancestral roots in southern China from Fujian, Guangdong and Hainan provinces. During British rule in Singapore and then under British Malaya before independence, Singapore and the Republic of China had diplomatic relations. When Singapore became independent in 1965 from Malaysia, it continued to recognise the Republic of China as the legitimate government of China. In the 1970s, People's Republic of China and Singapore began unofficial relations. This led to the exchange of Commercial Representatives' Offices between the two nations in 1981. In 1985, commercial air services between mainland China and Singapore commenced. Diplomatic ties between the two countries officially began in 1990. Singapore was the last country in South East Asia to formally recognise the People's Republic of China out of respect to Indonesia, sensitivities in the region and fears from neighbouring countries of communism in those times. Singapore still maintains unofficial relations with the ROC, including the continuation of a controversial military training and facilities agreement from 1975. This is due to a lack of usable space in built-up Singapore. The People's Republic of China has proposed that Singapore relocate some of its training facilities from Taiwan to Hainan province, however Singapore has not as of yet accepted such an offer. Bilateral ties took a dive when Singapore's deputy Prime Minister Lee Hsien Loong travelled to Taiwan for a private visit in 2004. The People's Republic of China took offence to the trip as due to the complicated political status of the region Later in 2004, Chinese government put bilateral relations on hold. Relations between the two countries gradually improved as China and Singapore forged agreements in free trade, education, foreign investment and technology. Examples are the Suzhou Industrial Park and the Sino-Singapore Tianjin Eco-city, which were constructed with the help of Singapore. Have China and Singapore kissed and made up? 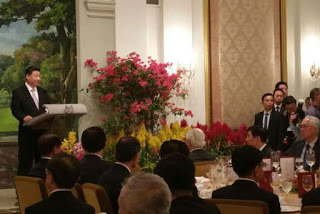 The 3d Singapore-China government-led project will be based in Chongqing, Chinese President Xi Jinping said at a state banquet at the Istana on Friday (Nov 6). "During my visit, the 2 sides will officially launch the third project based in Chongqing," Mr Xi said. The bilateral project will be on the theme of "modern connectivity and modern services", and could help lower the cost of doing business in China's western region.